Vessel Max by Ortho Molecular is no longer available online. 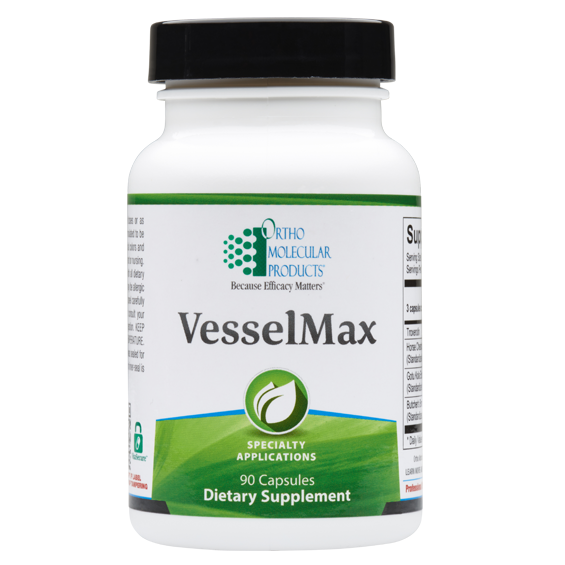 VesselMax is formulated with a blend of nutrients that support the integrity of health veins and promote efficient vessel function. VesselMax includes a powerful blend of botanical extracts shown to promote healthy leg microcirculation and to support tone and flexibility of veins, as well as overall vessel health. 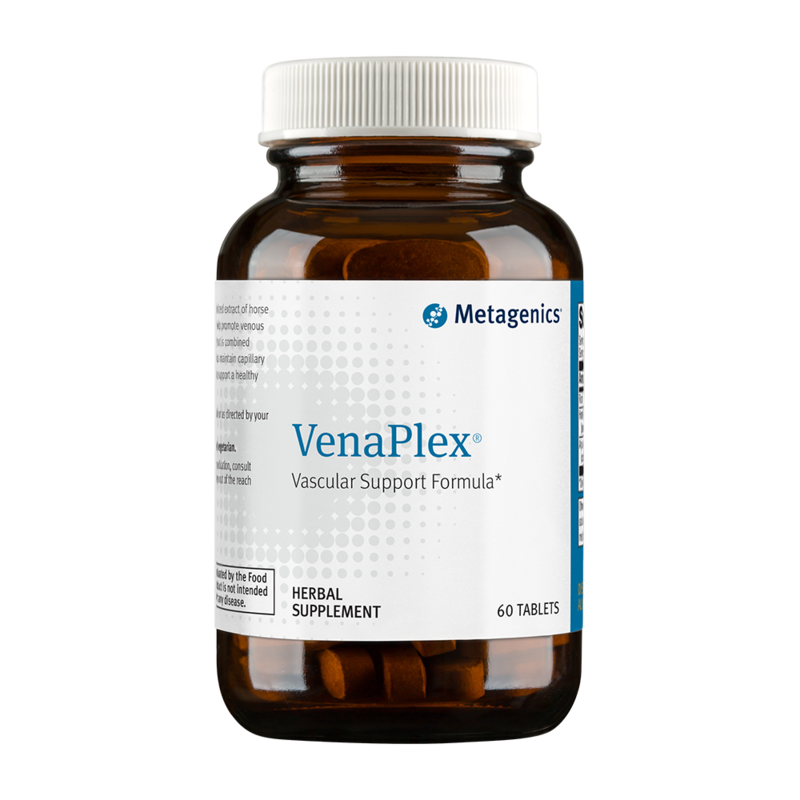 The five ingredients in VesselMax work synergistically to support all layers of the veins and the cardiac valve. 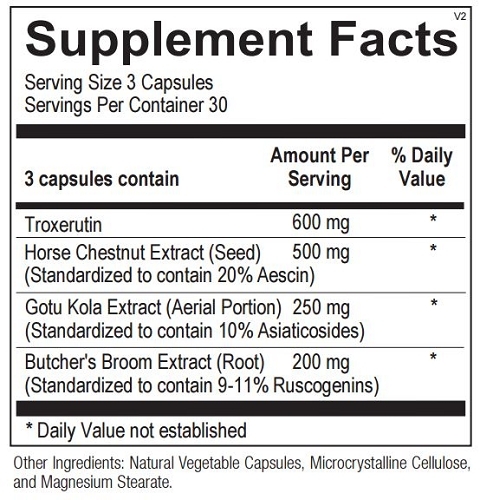 VesselMax includes 600 mg troxerutin, 500 mg of standardized horse chestnut extract (20% aescin), 200 mg standardized butcher’s broom (9-11% ruscogenins), and 250 mg standardized gotu kola (10% asiaticosides) per threecapsule serving, providing full-spectrum vein support. The body’s veins perform many functions that are vital to the entire circulatory network as a whole. This includes functioning as a passageway for blood to flow back to the heart, regulating the flow of blood via constriction and dilation, as well as storing large volumes of blood required for the proper function of numerous organs including the heart. The alteration of venous health and blood flow can affect cardiovascular health and circulation throughout the lower limbs. Venous difficulties in the lower limbs can result in achy and heavy legs, tingling sensations, cramps, itchy and hot feet, as well as unsightly veins. Each vein is composed of three different layers: the Tunica intima (the innermost layer), the Tunica media (the smooth muscle layer), and the Tunica externa (made up of loose fibrous connective tissue, collagen and hyaluronic acid). Venous difficulties begin when the integrity of the vein is compromised in one or more of the layers. VesselMax contains a powerful and synergistic blend of botanicals that support each layer of the vein, resulting in improved microcirculation and vessel integrity, while preventing the excessive capillary leakage of fluids. 1. Boisseau MR, Taccoen A, Garreau C, et.al. Febrinolysis and hemorheology in chronic venous insufficiency: a double blind study of troxerutin efficiency. J Cardiovasc Surg (Torino) 1995 Aug;36(4):369-74. 2. Poynard T, Valterio C. Meta-analysis of hydroxyethylrutosides in the treatment of chronic venous insufficiency. Vasa 1994; 23(3):244-50. 3. Cesarone MR1, Belcaro G, Ippolito E, Pellegrini L, Ledda A, Luzzi R, Ricci A, Dugall M, Bavera P, Hosoi M, Stuard S, Corsi M. Clinical improvement in chronic venous insufficiency signs and symptoms with Venoruton® (HR): an 8-month, open-registry, cost-efficacy study. Panminerva Med. 2010 Jun;52(2 Suppl 1):43-8. 4. Horse Chestnut. Alt Med Rev 2009;14(3):278-83. 5. Facino RM, Carini M, Stefani R, et.al. Anti-elastase and antihyaluronidase activities of saponins and sapogenins from Hedera helix, Aesculus hippocastanum, and ruscus aculeatus: factors contributing to their efficacy in the treatment of venous insufficiency. Arch Pharm (Weinheim) 1995 Oct;328(10):720-4. 6. Greeske K, Pohlmann BK Horse chestnut seed extract an effective therapy principle in general practice. Drug therapy of chronic venous insufficiency. Fortschr Med 1996 May 30;114(15):196-200. 7. Diehm C, Trampisch HJ, Lange S, Schmidt C. Comparison of leg compression stocking and oral horsechestnut seed extract therapy in patients with chronic venous insufficiency. Lancet 1996;347:292-294. 8. Bouskela E, Cyrino FZ, Marcelon G. Effects of Ruscus extract on the internal diameter of arterioles and venules of the hamster cheek pouch microcirculation. J Cardiovasc Pharmacol 1993 Aug;22(2):221-4. 9. Bouskela E, Cyrino FZ, Marcelon G. Possible mechanisms for the inhibitory effect of Ruscus extract on increased microvascular permeability induced by histamine in hamster cheek pouch. J Cardiovasc Pharmacol 1994 Aug;24(2):281-5. 10. Cappelli R, Nicora M, De Perri T. Use of extract of Ruscus aculeatus in venous disease in the lower limbs. Drugs Exp Clin Res 1988;14(4):277-83. 11. Rudofsky G. Improving venous tone and capillary sealing. Effect of a combination of Ruscus extract and hesperidine methyl chalcone in healthy probands in heat stress. Fortschr Med 1989 Jun 30;107(19):52,55-8. 12. Parrado F, Buzzi A. A study of the efficacy and tolerability of a preparation containing Ruscus aculeatus in the treatment of chronic venous insufficiency of the lower limbs. Clin Drug Invest 1999;18:255-261. 13. Cappelli R, Nicora M, Di Perri T. Use of extract of Ruscus aculeatus in venous disease of the lower limb. Drugs Exp Clin Res 1988;14:277-283. 14. Jaeger K, Eichlisberger CH, Lobs J, et al. Pharmacodynamic effects of Ruscus extract (Cyclo 3 Fort ®) on superficial and deep veins in patients with primary varicose veins. Assessment by duplexsonography. Clin Drug Invest 1999;111-119. 15. Berg D. First results with Ruscus extract in the treatment of pregnancy related varicose veins. In: Vanhoutte PM, ed. Return Circulation and Norepinephrine: An Update. Paris, France: John Libbey Eurotext; 1991:55-61. 16. Rudofsky G. Effect of Ruscus extract on the capillary filtration rate. In: Vanhoute PM, ed. Return Circulation and Norepinephrine: An Update. Paris, France: John Libbey Eurotext; 1991:219-224. 17. Kiesewetter H, Scheffler P, Jung F, et al. Effect of Ruscus extract in chronic venous insufficiency state I, II, and III. In: Vanhoutte PM, ed. Return Circulation and Norepinephrine: An Update. Paris, France: John Libbey Eurotext; 1991:163- 169. 18. Arpaia MR, Ferrone R, Amitrano M, et.al. Effects of Centella asiatica extract on mucopolysaccharide metabolism in subjects with varicose veins. Int J Clin Pharmacol Res 1990;10(4):229-33. 19. Maquart FX et al. Triterpenes from Centella asiatica stimulate extracellular matrix accumulation in rat experimental wounds. Eur J Dermatol 1999; 9(4):289-96. 20. Pointel JP, Boccalon H, Cloarec M, et.al. Titrated extract of Centell asiatica (TECA) in the treatment of venous insufficiency of the lower limbs. Angiology 1987 Jan;38(1 Pt 1):46-50. 21. Belcaro GV, Grimaldi R, Guidi G. Improvement of capillary permeability in patients with venous hypertension after treatment with TTFCA. Angiology 1990 Jul;41(7):533-40. 22. Belcaro GV, Rulo A, Grimaldi R. Capillary filtration and ankle edema in patients with venous hypertension treated with TTFCA. Angiology 1990 Jan;41(1):12-8.